Ooooh, you have the Casebook! Congrats! I found out about it, got some screen shots to ogle, and did a long post mostly about the Casebook. I love this pic too. He’s so _shocked_ that John’s leaving. (“I need some air.”) Sherlock, honey, there was never a rule that said you were the only resident pouter. Stop presuming, my lad, it’s bad for you — you ought to know better by now. It’s very well done piffle. The sticky-notes are brilliant. A few more photos of our heroes might have ben nice, but I guess they have to save something for the calendar (sold out from wholesalers everywhere according Odyssey Bookshop) and future goodies. I do wish we we’d get a blooper reel at some point. As for the pouting, John, doesn’t pout. He sulks. He sulks beautifully. 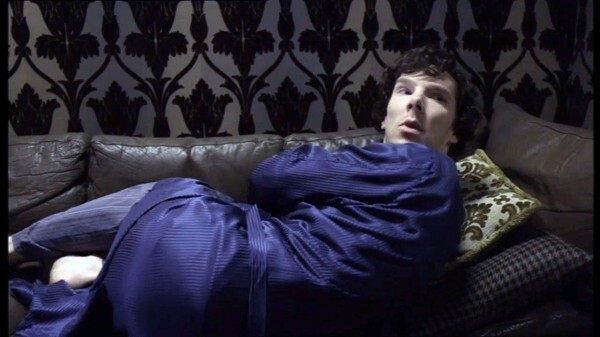 Leaving Sherlock in his snit was the perfect play for John, as Sherlock’s look of surprise shows. I suspect that when Sherlock pouted as a child, someone always tried to jolly and coax him out of it and he got lots and lots of attention. By leaving, John, takes away the attention and the audience, completely defusing the value of the pout. I suspect John mastered this technique with Harriet… now if he could just get the hang of girlfriend relationships. Keep them straight, John. You have to keep them straight. =chuckles= I don’t know that it was deliberate. John probably _wished_ he could walk away from Harry half so much! But it was clever; “I need to get some air” got Sherlock’s attention. Just as he’d gotten John’s when he left in Study. Sally was all “He does that” as if Sherlock was a cat who’d gotten bored with a toy. Instead of realizing that hey, if he left, there was a reason. Something else had attracted his attention, certainly. The gift of being outside and us being able to see what Sherlock was doing, rather than being in the story and twenty steps behind him. So… I don’t know. I suspect with John that rather than punch Sherlock, he left. Definitely had the novelty of working well.